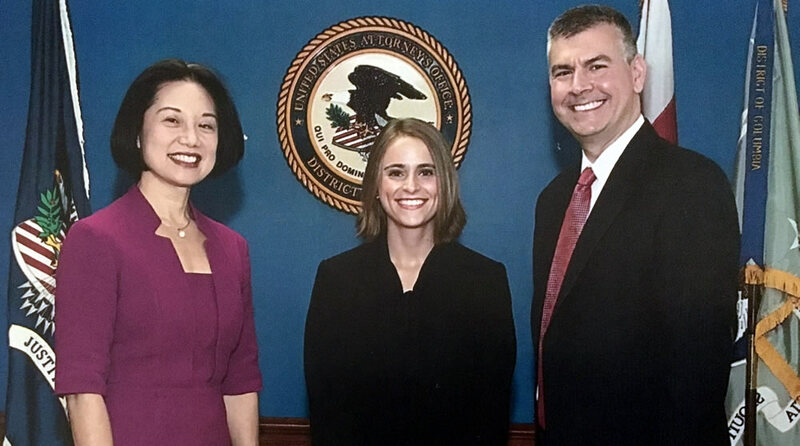 One Profession, Many Jobs Blair Barker '20L split her summer between a small firm in Chattanooga and the U.S. Attorney’s Office in D.C.
Blair Barker grew up in Chattanooga, Tennessee. She attended Jacksonville State University where she majored in Criminal Justice and played on the soccer team. At W&L Law, she is Vice President and Treasurer of PILSA. For the first month of summer, I clerked for a small disability law firm. For the remainder of my summer, I interned for the U.S. Attorney’s Office in D.C. in the Felony Major Crimes Division. I received the firm job from an alumnus that lives in my hometown. He heard that someone from Chattanooga went to W&L Law and asked me to reach out to him. I mass applied to U.S. Attorney’s offices and District Attorney’s offices in all of the cities in which I potentially wanted to live. I came across the D.C. office application online and submitted my materials. I worked in two very different environments this summer. During my time at the firm, I was essentially assigned one major research assignment by one of the partners. The assignment started out small, but kept expanding. I wrote a memo about what I found at the end of the summer for the partner to potentially use in an article. During my time at the U.S. Attorney’s office, I was able to work directly with the attorneys on cases. I watched officer body cam footage of defendant’s arrests, listened to jail calls, prepared memos to be used in trial, researched statutes, and wrote a few motions that were filed in court. I had the opportunity to observe trials from motion hearings all the way to closing statements. My research skills developed the most over the course of the summer. I became more efficient at finding the answer I needed throughout the summer. My legal writing improved as well. I think by observing how the attorney’s conducted themselves and having to communicate with them, I became more effective at communicating like a lawyer. Legal research and legal writing were by far the most useful for me this summer. I also used what I learned in Administrative Law during my time at the small law firm. Criminal Law was the most useful during my time at the U.S. Attorney’s Office. I was surprised at how much preparation is required to get a case ready for trial. I was also surprised at how much trust the attorney’s placed in the interns in finding the answer to their research question or addressing all of the arguments defense counsel made in motions. My favorite aspect of this summer was being able to go to court to watch anything from day to day hearings to trials. I also enjoyed being able to observe a civil trial and compare it to a criminal trial. This summer exposed to two very different types of work. Being afforded the opportunity to work in two different environments affirmed what I do and do not want to do.